The art was simply stunning, amazingly animated, and just appealing to the eyes and heart. You will instantly fall in love with the cute characters with their various personalities, style and appeal. The backgrounds and sceneries within this anime was simply amazing and realistic to it's place and setting. The various fire and smoke effects to the flashes from the rifles were highly detailed. It was simply a wonderful piece of art that suited the historical setting really well. I enjoyed watching and listening to the opening theme songs. 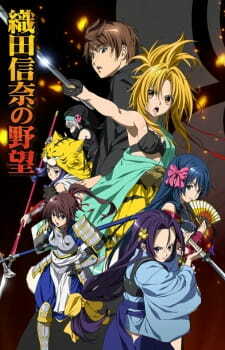 It was awesomely directed and showed plenty of action scenes whilst introducing every character in the anime. The ending song was also quite good too, not to mention the well directed background music that subtlety played in various scenes. In addition, the voice acting was quite good and suited many of the characters throughout the anime. I know very little about Japanese history, so I did not know any of the character's names from the past. Even towards the end, I struggled to connect the name to the face of many of the characters. The anime even did some frozen shots of the character in the beginning that introduced the characters' names and such, but I just couldn't remember them all. Anyhow, that aside, I loved every single character in this anime. They all complemented each other very well from your typical tsundere lord to your stuttering ninja. The characters all had unique personalities which made the anime quite fun to watch. In the end, it was an exciting anime to watch. Right at the end, it felt that the story did not end at all. This is one of those uncommon animes that made me want more! That said, the anime series is relatively short (only 12 episodes) and so it ended with what seems to be a small cliffhanger (or rather an unfinished story in a good sense). I really wanted to know why and how did Sagara managed to travel back in time, but the anime did not explain any of that. I am wanting a sequel to this to give me the answers I want! It was fast, engaging, and full of life. It was interesting historical comedy anime with some romance in it. Simple wonderfully illustrated and animated. The characters all looked cute and the backgrounds were highly detailed. Voice acting was really good for most of the characters. They suited the characters' personalities really well. Loved them all. They all had unique personalities and attitudes. It was fun and exciting to watch. The story and action is quite good as well. This is one anime I definitely would recommend anyone that is into historical anime to watch.